This tangy tomato and almond based pesto is good on pasta, pizza, and sandwiches. Make a big batch and freeze some for later! 1. If using sundried tomatoes not packed in oil—add tomatoes and water to a small saucepan and bring to a boil. Remove from heat and let set for 20-30 minutes. If using sundried tomatoes packed in oil—add the tomatoes (without oil, of course) and water to a small saucepan and heat water, but do not boil. Let them soak in the hot water for about 15 minutes. Think of it as infusing the water. 2. Add tomatoes, almonds, red pepper, garlic to food processor and commence zapping—with blades still running add the cheese, basil, salt and olive oil. Then gradually add tomato water until you get the desired consistency. This will probably be anywhere from a half cup to a whole cup of the liquid. The pesto should keep about 1 week in the fridge, and several months in the freezer. fresh chard from our raised bed! The tangy zing from the tomatoes makes this pesto a good match for greens, like chard, that have a slight bitterness to them. You can bake the chicken like I did here, or pick up a rotisserie chicken and add shredded pieces to the mix. *Quick baked chicken—take a one pound pack of boneless chicken breasts, put them in a casserole/baking dish with ¼ cup of water and 1 Tbsp of olive oil and cook covered at 350º for about 40 minutes. Let stand about 5 minutes before shredding. 1. Cook pasta, drain and set aside. 2. Meanwhile sauté the garlic and shallots until just tender. 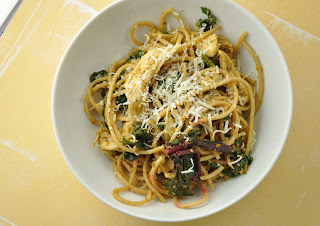 Add the chard and cook until the leaves turn bright green—this shouldn't take long. 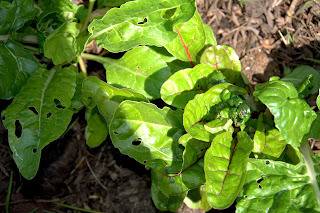 Now if you like your chard extremely tender, add the water, cover, and cook an additional 2-3 minutes. If you don't mind a little crunch, you can skip adding the water and instead just sauté them for another 3-4 minutes (uncovered). 3. 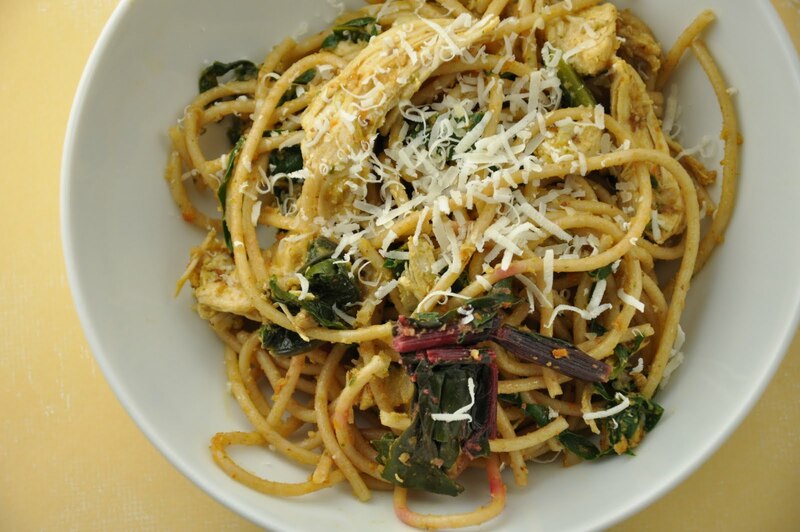 In a large bowl, combine the pasta, shredded chicken, and greens mixture, and toss with the pesto. How much of the pesto you want to add is up to your personal taste. If you have some leftover, put it on a sandwich the next day. Serve with grated Parmesan. You read my mind! I was just thinking the other day that I should start experimenting with different types of pesto instead of just the old basil and pine nuts. I can't wait to try this version with sundried tomatoes!